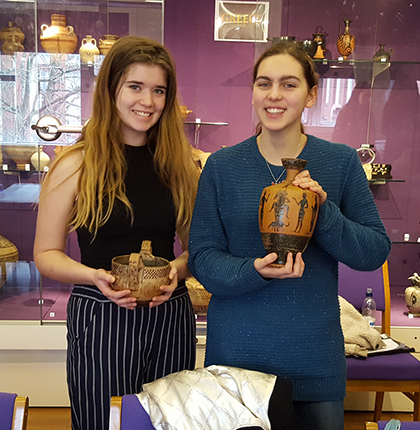 Students at The Sixth Form College, Solihull attended the University of Birmingham Classics Conference recently to explore the latest research in the Ancient World. A group of six A level Ancient History and Classical Civilisation students were at the Saturday event in Birmingham. They handled and examined artefacts from the Black Sea and Classical Athens and were involved in lively readings of plays in the original Greek, retold by Dr Lucy Jackson from Kings College London. Topics on Women in Classical Literature were explored, including discussion on the unsung voices of female characters. Isobel Thomson and Verity Brookes (former students of Swanshurst and Queensbridge Schools respectively) were two of the students who attended the Conference and they found the activities both exciting and useful in supporting their A level courses. They said that they had learned to look at the ancient sources in different ways and it had helped them relate better to the audience at the time the plays and poems were composed, as well as helping them make links between Classics and their other subjects. Ancient History and Classical Civilisation are just two of the A level courses offered by the Humanities department at the College. Among the 43 advanced level courses the College offers, Geography, History and Religious Studies are also part of the Humanities options on offer to students at A level.